Bayern Munich made a losing start to the eighth Alkass International Cup with a 3-2 defeat by Etoile Sportive Du Sahe, but the German youngsters are in good hands as they are being coached by one of the most famous strikers of all-time. Miroslav Klose took over from Holger Seitz as head coach of Bayern’s Under 17 team nine months ago and is hoping to produce the next in a long line of star strikers to represent the Bavarian Reds from Germany. Whether the next Robert Lewandowski, Gerd Müller, Thomas Müller or Karl-Heinz Rummenigge was on show at Aspire Academy remains to be seen but the Bayern teenagers could not ask for a better role model to learn from. The Polish-born 40-year-old was a legend for club and country alike, helping Germany to glory at the 2014 FIFA World Cup, the competition that always seemed to bring out the best in him. Klose is the top goalscorer in the history of the FIFA World Cup with 16 goals, scoring five at each of his first two appearances in the sport’s showpiece event in 2002 and 2006. He won the Golden Boot at the latter, held in Germany, and added four more goals at the 2010 competition before overtaking Brazil legend Ronaldo’s record of 15 goals four years later. Klose is Germany’s all-time top-scorer with 71 goals in 137 appearances and the national team never lost a game in which he scored. Although best known for his performances with the Germany national team, Klose was also a class act for Bayern where he scored 52 goals in four seasons from 2007 to 2011, helping the club to five major trophies as well as reaching the Champions League final. 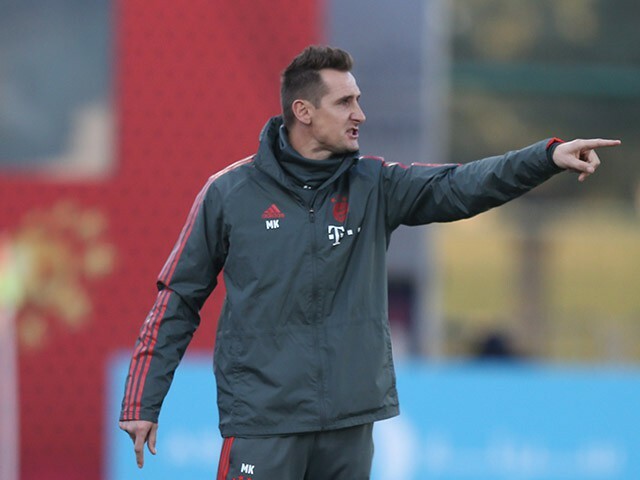 After ending his playing career in Serie A, where he scored more than half-a-century of goals over two seasons with Lazio, Klose moved into coaching when joining the backroom staff of the German national team, and now he is charged with developing the best teenage talent at Bayern. Klose, whose own youth football was spent at SG Blaubach-Diedelkopf, has plenty of promising talent to work with, as seven players with international experience are among the Bayern squad in Doha this year. Two of those internationals, Nemanja Motika and Moritz Mosandl, netted in the closing stages to reduce the arrears after the Tunisians had gone 3-0 ahead. Motika produced a finish Klose would have been proud of himself, chesting the ball down before firing home, while Mosandl made it 3-2 from the spot minutes later. Despite the defeat, the Germans showed enough attacking flair to suggest they will win far more than they lose. Bayern have five Bundesliga Under-17 titles to their name but with a legend like Klose coaching the club it should not be too long before they add to that tally. Asked about the Al Kass International Cup, Klose stated: “The tournament is being shown on TV here, so it is certainly something special for the local community. However, we see it more as a training camp. We have come here with quite a few very young players, so our main objective was to simply play football." Klose’s side will look to bounce back when they take on Turkish side Altinordu on February 9, when they look to find their scoring boots much earlier than they did against Etoile Sportive.